The Bay Saint Louis Rotary Club hosted the annual Chili Cook Off on Friday at the New Bay St. Louis Community Hall. The event had 19 teams competing for Best Chili bragging rights. The chilies prepared were diverse and really tasty. Chilies offered were made of chicken, beef or pork and in a range of colors from red to green. Fun was had by all and antacids were had by many. Seems like many afternoons the fog is just rolling in off the Gulf. Makes for some incredible pictures and some pretty spooky looking scenes. Fog always adds the mystery or unknowns to a picture, event, or activity. This afternoon I shot some pictures of Old Town Bay St. Louis when the fog rolled in. It is always funny how fog can play tricks on your ears and your eyes. Sounds seemed amplified and their direction unsure. Take a walk if you get a chance and watch this beautiful occurrence. Bay St. Louis did a wonderful job making a wide open area into a sweet spot. The Duck Pond is phenomenal! Kids and adults both love to come here. There are benches and swings around to relax and watch the ducks play. 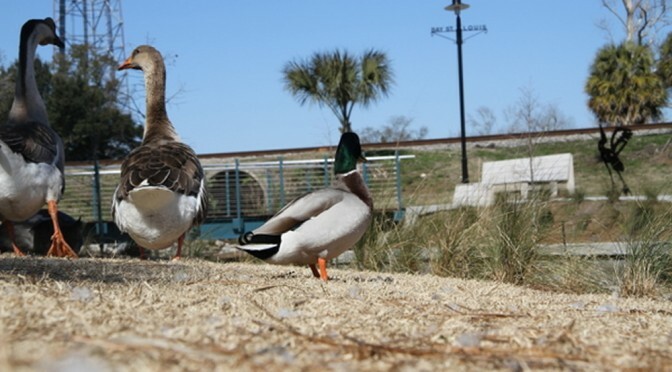 If you want to be more involved, the ducks love to be fed. The park includes a great water crossing bridge complete with a small waterfall type scene. I know many an hour will be spent enjoying this wonderful scene set in the heart of Old Town. 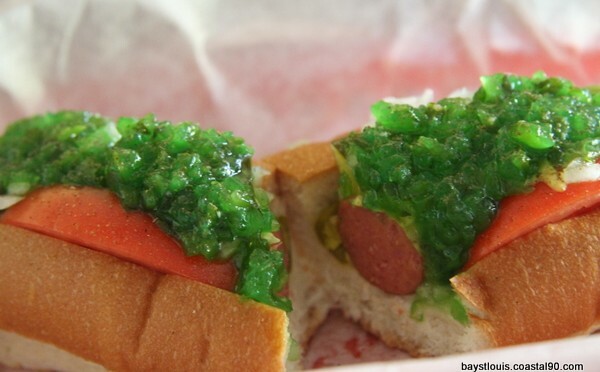 Sloppy Dog’s Cafe is a masterpiece in Hot Dog dining. This restaurant has mastered a food that I think should have its own place in the food pyramid. I am heading to the sloppy dog for lunch today. It is easy to find and is located in Waveland off Hwy 90. This is small family run restaurant that takes extreme pride in delivering a great experience at a resonable price. There is a wide selection of dogs and weiners on the menu; something for everyone. The Chicago Dog is my favorite. It has a Natural Casing All Beef Dog with Sport Peppers, Neon Relish, Tomato Wedges, Onions, Mustard, Crunch Pickle Spear and Celery Salt. The dogs are hot and the buns are moist. The food is prepared as you wait and the service has been excellent. War & Peace is a wonderful museum of over 4000 models. This collection, as the curator Joe Monti describes it, is part of the life's passion of his father Mr. T.F. Monti. I knew there was a lot of models to be seen, but the scope and depth of the collection was staggering. There are rooms for cars, boats, planes, rockets and tanks. I think there is enough armament to represent over a hundred years of military maneuvering. There is also a great legacy of Mr. Monti's model building ability house in this building. While this is not his entire life's work, it is enough to make you stand back and see a person's work . I could picture Mr. Monti sitting at his desk, which is on display, working and tinkering with paint glue and a razor knife.